As season 5 of Masterchef Australia is currently screening in my homeland, we’re catching up on the second series from 2010 here in the UK. So far it’s been a fantastic way to introduce Mr Q to several Aussie foodie quirks, and the episode we watched a few nights ago was the perfect introduction to the Australian-style beef burger. We watched goofy contestant Matthew build his towering ‘Megasaurus’ beef burger as Mr Q exclaimed, “You can’t put pineapple on a burger!” Oh yes, you can. It’s one of my favourite burger toppings. So I set out to prove to him that once you slap a pineapple ring on it, you’ll never look back. I’m not even going to bother writing up a recipe for this one – the only bit that takes a bit of effort is mixing up the burger mince. For this, I added to 600g of minced beef an egg, 3/4 cup of panko crumbs, a good shake of oregano, a good sprinkle of cayenne pepper, and plenty of salt and cracked black pepper. Simple. I shaped the mince into three burger patties (200g each is a pretty massive meal-sized burger), and grilled until crispy on the outside, while still a little pink on the inside. Then, it’s a matter of building the burger with whatever ingredients you have to hand. As I mentioned earlier, pineapple is essential for me. Nothing goes better with pineapple than crispy bacon, so that’s also very important. Another very Aussie addition is beetroot – so plenty of that, along with some cheddar cheese, a bit of greenery (watercress, in this case), mayonnaise and ketchup. I’d like to have also added caramelised onions and a fried egg, but it was getting a little hard to manage. Served with chips and a cold beer, I felt rather pleased with my burger, and by all accounts, Mr Q was also very satisfied. What’s your essential burger topping? Have you ever tried pineapple? Tags: Australia, australian food, bacon, baking, bbq, beef, beetroot, cheese, cooking, food, ketchup, masterchef australia, pineapple, recipe, recipes. Bookmark the permalink. Salivating. Now I really REALLY want a burger tonight with all the trimmings! You’ve just reminded me I used to go to an amazing burger (and probably lots of other things) restaurant many moons ago. To memory they were the best burgers I’ve ever eaten, always topped with pineapple, bacon and cheese….plus mayo and various burger relishes. De.Lich.Ous. 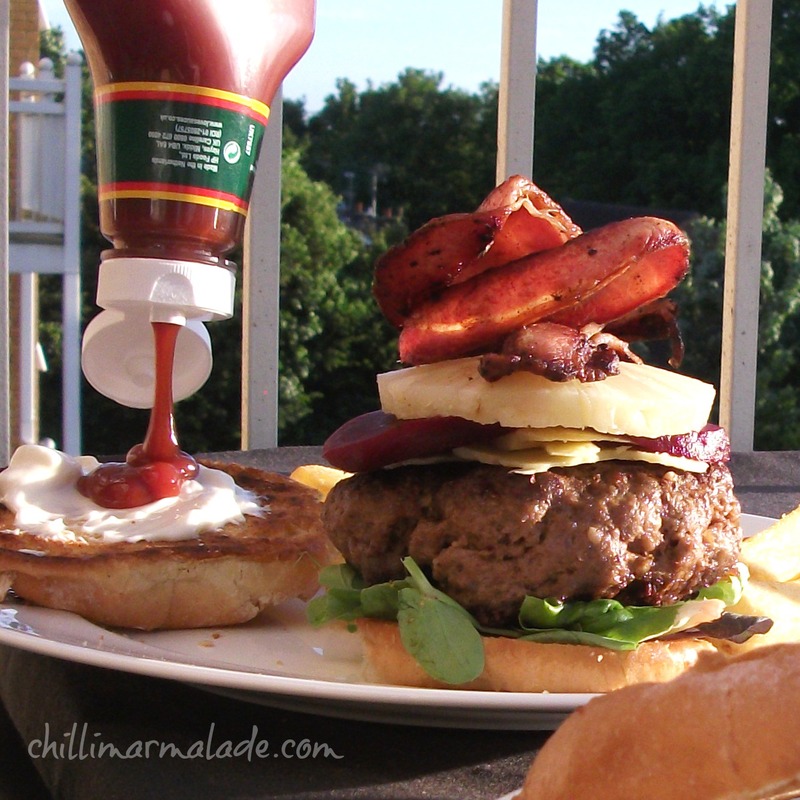 I like a good gourmet relish on my burger – but sometimes you just can’t go past a good dollop of regular ketchup! I can’t BELIEVE you missed out the egg. I know, I know…. Next time! Aww- I would totally have risked the extra egg and onions. oh, yes I want one now…..looks soooo good. That burger looks awesome! 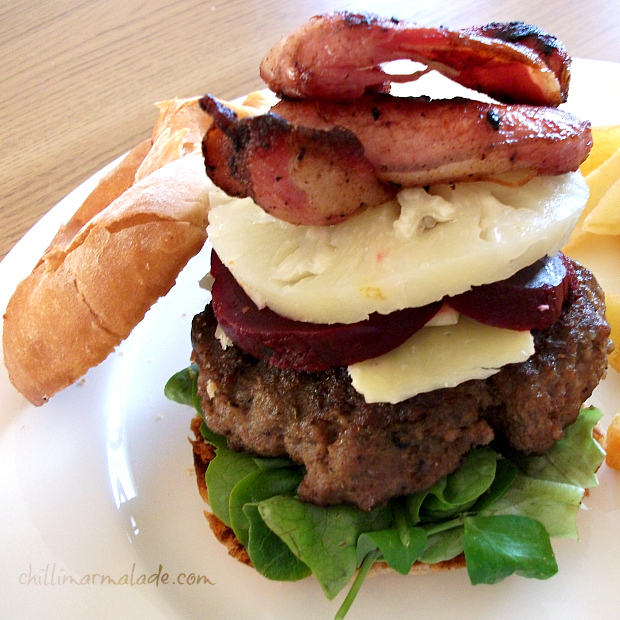 I totally agree….beetroot and pineapple make the burger sooo much better! My essential ingredients is red onion marmalade. Sweet, sour, caramelized onions = yummy for my tummy. Aussie Aussie Aussie!!! Oi oi oi! I love the various versions of Masterchef – I became worryingly addicted to the South African version earlier this year. I think it’s a great insight into the different “food cultures”. Pineapple and beetroot? Sounds a bit scary to this Yorkshire person! What.A.Monster!!! I’d gladly take this into my belly without a second thought. *Evil grin* Personally I’m not a pineapple sort of person, I don’t even like it on pizzas! So maybe my opinion is moot. haha. But I do love Ali’s suggestion of beetroot – that is just amazing! Beetroot is vital, as is a fried egg. It’s a heart attack in a bun, but anyway….